Braces for Adults options include, Invisalign invisible braces, lingual braces and of course traditional metal bracket braces. Visit Dr. Leo today! Adult Braces, It's not too late! I am impressed every time I see an adult wearing metal braces. I too wore metal braces as an adult, so I understand it can be inconvenient, but the rewards are amazing. More adults than ever are seeking orthodontics, with traditional, "invisible"clear braces or clear Invisalign aligners, to improve their smiles. There is no better way to uplift another person's spirits, and your own, than by sharing a smile. It's contagious too – when you show off your straight new smile, you'll get smiles in return! Have you heard that braces are painful, or treatment takes too long? This is rarely the case, thanks to advanced technology and materials. We offer inconspicuous, comfortable Invisalign aligners, and our traditional braces including our state-of-the-art Invisible Clear Aligners that are gentle, yet effective. If you have concerns about adult braces, come see me for a complimentary consultation and let me dispel your fears. We measure our adult orthodontic Express Braces treatment plans in months, not years! Adult Express braces are a great alternative to dental veneers for straightening teeth. Even if veneers are needed to cover chips or permanent discoloration, straightening teeth first can mean less tooth material needs to be removed. I will work with your dentist to create the best smile that you deserve. Please note that jaw alignment and significant facial changes may need conventional orthodontics and/or cosmetic plastic/jaw surgery; together we will explore your needs if you are unsure. Register as a new patient, and come to Just Smile Orthodontics for your complimentary consultation, to see how I can help you get straight teeth in months, not years. We will take x-rays, photos, and impressions before I plan your treatment. This is the most important step, because the treatment plan is like a treasure map. We need the map to know the exact path to the treasure, which is your million-dollar smile! When your braces are removed (or Invisalign treatment is complete), I want to see not only straight teeth – but also healthy, beautiful teeth. Without excellent oral hygiene, your teeth could develop scars, and decay. This could lead to costly restorative treatments. See how to clean your teeth with braces. We even offer a special whitening system that you can use just before treatment is complete! Some dental insurance will cover a portion of the costs for adult orthodontic treatment. For your convenience, please provide the details of any dental insurance you have in advance. We can look into it, and determine the extent of insurance coverage, before your complimentary initial appointment. It's never too late for straighter teeth! Come to Just Smile Orthodontics today, and see how I can help you to straighten your smile in months, not years! 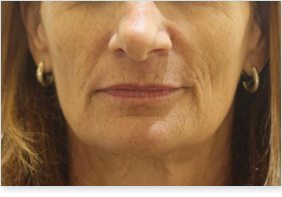 This 50 year old patient, P.M., had collapsed dental arches that are evident by the shrunken facial pattern. 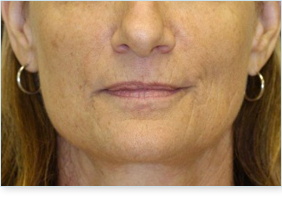 Notice the final facial pattern is fuller and more youthful looking. Although the treatment was not considered completed, P.M. was so thrilled with the results that she wanted the braces off sooner.